Peru. Lecture on “Science and Magic in Classical Greece” at NA Lima, to mark World Philosophy Day. Argentina. Philosophy as a Way of Life talk at an NA center in Argentina for World Philosophy Day. Chile. 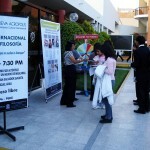 Volunteers from NA Talca promote philosophy for World Philosophy Day. Chile. Volunteers from NA Talca (Chile) evoke Greek philosophers in the city streets. Chile. 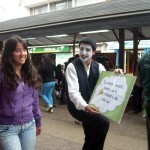 NA volunteers promote philosophy in the streets of Temuco (Chile) for World Philosophy Day.